The CNEWA team visited St. Lawrence Martyr Parish in the Archdiocese of Baltimore. Last weekend, our little CNEWA team hit the road once again, this time heading to Hanover, Maryland in the Archdiocese of Baltimore. There, we spent time at St. Lawrence Martyr Parish, where I had the privilege of preaching at all the Masses and sharing the story of CNEWA’s work in the Middle East, particularly among refugees and those who have faced religious persecution. In 1999, the Trinitarian Order established an organization within their order called SIT (Solidaridad Internacional Trinitaria or Trinitarian International Solidarity) that focuses on our fellow Christians who suffer persecution because of their commitment to Christ and His Church. In October 2015, we started SIT St. Lawrence at the parish level to try and bring awareness and assistance to the persecuted Christians around the world. It was this group, under the leadership of parishioner Matt Behum, that welcomed us to the parish and gave us the opportunity to share our story at the Masses. Matt Behum, center, welcomed Chris Kennedy (l) and Deacon Greg Kandra (r) to the parish. 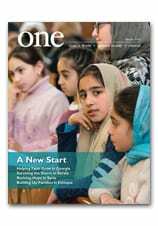 The people in the pews were eager to learn more and my colleague, development associate Chris Kennedy, was only too happy to share information, literature and copies of our award-winning magazine, ONE. It was a wonderful weekend. We’re grateful to the faith community at St. Lawrence for their warn welcome. We want to thank in particular the Trinitarians— the Rev. Binoy Akkalayil, O.SS.T. and the pastor, the Rev. Victor Scocco, O.SS.T.—for their generous hospitality and fellowship. During this season of Advent, it was especially meaningful to speak about bringing the light of Christ into the world through our mission and our ministry, and to remind people of the ongoing suffering of so many of our brothers and sisters around the world. We continue to lift them up in prayer. We’re always eager to spread the word about CNEWA’s work and let others know how they can make a difference. If you would like us to visit your parish or group, please drop Chris Kennedy a line: ckennedy@cnewa.org.